Click on SLIDE SHOW to CONTROL! Our sun provides almost all of the energy in the food chain that we and other animals use for fuel. Plants are the most abundant food source on the planet. Herbivores, like bunnies, eat the plants. Carnivores, like coyotes, eat the herbivores. In this manner the energy that originated with sunlight continues to provide energy throughout the ecosystem. Photosynthesis is the process in which plants transform light energy into chemical energy. Plants are BY FAR the Most Abundant Food Resource on Earth! Autotrophs make their own food. Most of the organisms that are categorized as autotrophs use photons, or sunlight energy, to make sugar. These are called phototrophs. All plants are phototrophs. They gain their ability to photosynthesize from the photosensitive pigments like chlorophyll. Chlorophyll undergoes a conformational change when the molecule absorbs a photon. of a specific wavelength. Chlorophyll a is the most abundant photosensitive pigment in plants. Chlorophyll a absorbs photons, or light energy, that has a wavelengths of 430nm(blue) and 662nm(red). Notice that is DOES NOT absorb green wavelengths of light. The reason why chlorophyll-containing plants appear GREEN to us, is because chlorophyll reflects green wavelength of light. Once plant capture the light energy, they use it to make chemical energy through photosynthesis. Omnivores are animals that eat plants and meat. omni means 'all' in Latin. we can think of plants as prey of herbivores. Predation is a strong, selective pressure that drives prey organisms to find ways to avoid being eaten. Plants cannot escape predators by fleeing, but they possess adaptations that protect them from being eaten. The presence of spines, thorns, tough leathery leaves, or even thick wax on leaves discourages foraging herbivores from grazing. Other plants produce an array of protective chemicals that are unpalatable or even toxic to herbivores. Some plants avoid herbivory by decreasing their apparency or ‘hiding' from herbivores in spatial or temporal refuges. 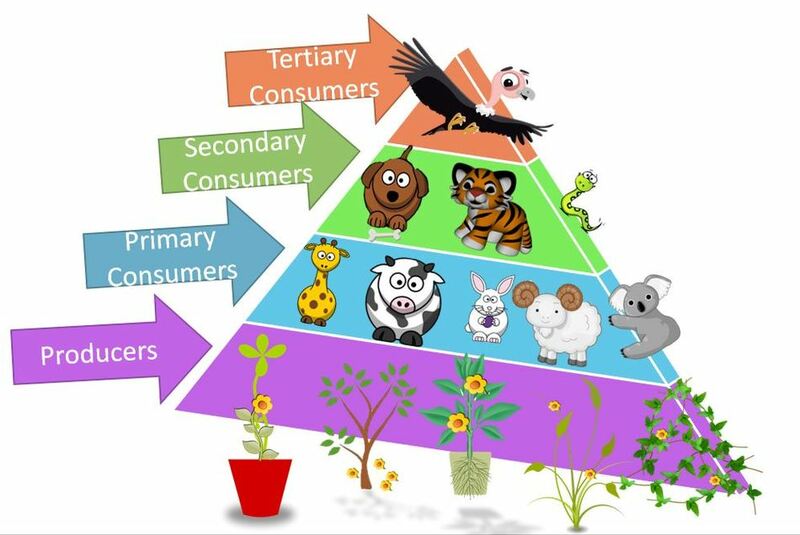 Plants may reduce herbivory by growing in areas inaccessible to herbivores as represented in the figure above. Sensitive plants (Mimosa pudica) limit herbivory by folding up their leaves after being touched (b), thus mimicking a dead, leafless plant. Stone plants avoid herbivores by blending in with their environment. Chemical defenses include compounds with chemical properties that directly deter herbivores from feeding on a plant. Some plants produce cyanide-containing compounds in their seeds that can kill herbivores when consumed in low doses. Condensed tannins are common quantitative defenses that bind to proteins, interfering with digestion. Other quantitative defenses include chemicals that cause pain, inflammation, or swelling in the skin or mouth when touched as in the case of stinging nettle (see ‘Structural defenses' above) or poison ivy (Toxicodendron radicans). Animals that have a diet composed entirely of plants are known as herbivores. In nature, there are many different types of diets for animals. Plants are found in every habitat, and often come in a wide variety of shapes, sizes, and colors. Due to their abundance, plants are the most readily available source of food on Earth. Herbivores have developed several physical adaptations that better enable them to survive and thrive as plant eaters. One major physical adaptation is the unique design of the herbivore's head, including its eyes, ears, and teeth. SPECIALIZED EYES - Most herbivores have eyes located on the side of their head. This adaptation makes it possible for herbivores to have a wider field of vision. Due to their eye placement, these animals can see almost all the way around their bodies without moving their heads. -- Why would these animals want to have such a wide field of vision? Many herbivores are prey for carnivores, meat-eating animals, and their visual adaptation makes it possible for them to notice a predator before being attacked, and, hopefully escape unharmed. SPECIALIZED EARS - Due to their role in the food chain, the sequence of who eats whom in an environment, herbivores have also developed well-designed ears to avoid predation. The ears of many herbivores are large, which increases the volume of the sounds they hear and makes it possible for herbivores to hear the otherwise low volume noises of an approaching predator. With eyes on the sides of their heads and large ears, herbivores increase their chances of avoiding predation and surviving to graze another day. SPECIALIZED TEETH - Herbivores also have specially designed teeth for their diet of plants. The average herbivore mouth is full of molars, which are flat and round teeth. These teeth are designed to grind up plant materials into smaller pieces so that the herbivore can more easily digest the material they consume. SPECIALIZED STOMACHE - Some herbivores have developed a unique digestive system to process the large amounts of plant material they ingest. Several animal species, such as cows and leaf-eating monkeys, have bacteria in their stomachs that help digest plant materials. The bacteria break down the plant material into a more easily digestible product for the herbivore. Without the bacteria, the herbivore would not be able to effectively break down the plant material and would not gain any energy from the food they consumed. SOCIAL ADAPTATION - In addition to physical adaptations, some herbivores have also developed behavioral adaptations to increase their survival. The most noticeable behavioral difference between carnivores and herbivores is how social they are. Carnivores tend to travel and hunt alone, while many herbivore species travel and eat in groups. This social behavior increases survival because the members of the group watch each other's backs and can protect each other from predators. In biology, many of the vocabulary words originate from Latin or Greek root words. For exampleCan you think of other words that have these roots? Herbicides are things that kill plants; chili con carne is chili with flesh (meat), and if someone is omnipresent, they are 'always' present. Eating plants requires special adaptations including different teeth, a different skull, and even a different stomach! Animals can have molars, premolars, canines, and incisors. The molars and premolars are in the back, the canines are the fang-type teeth seen in carnivores, and the incisors are the front teeth. Herbivores have flat molars and premolars to grind up plants. Some herbivores have a diastema, or space between the back molars and front teeth, which is used to carry plant material. Herbivores usually do not have canine teeth, and incisors may be absent as well. If they do have incisors, they are used to break off plant material. Look at this skull of a herbivore. Notice the flat molars and the space between the molars and the front teeth. The incisors on the top are not present, and the eyes are on the side of the skull. Animals that practice herbivory are often prey to carnivores. To minimize the chance of being eaten, herbivores have eyes on the sides of their head allowing them to have a better view of what is around them. Carnivores have eyes facing forward, which allows them to have improved depth perception, improving their ability to catch prey. Eating and digesting plant material takes a lot of work, so animals that practice herbivory require a special digestive system. Ruminants are herbivores that have a rumen. A rumen is a large vat located between the esophagus and stomach that houses microbes, such as bacteria, fungi, and protozoa. These microbes actually breakdown the plant material and then the ruminant regurgitates, re-chews, swallows, and the process continues until the plant-material is digested. If you have ever watched a cow or moose, it is always chewing. That is because it is a ruminant! Ruminants are also known as foregut fermentators. Animals with rumen include cows and deer. Unlike ruminants, hindgut fermentators have a digestive system that is similar to humans, except their large intestines are more complicated and larger. Like ruminants, hindgut fermentators depend on assistance from microbes to digest plant-material; however, these microbes are housed in the large intestine, and they do not have a rumen. Rodents, rabbits, and horses are examples of herbivores that practice hindgut fermentation. You may have noticed that fermentation was in the name of both types of digestion. The word fermentation, in this case, refers to breaking down of plant material by microbes into substances the animal can utilize. Animals that practice herbivory come in many shapes and sizes from enormous elephants to the small chinchilla. Some are slow moving, like the sloth of South America, and some are fast, like the quick-moving deer of North America. They are found in many animal families as well including Bovidae (the buffalo, cows, and sheep), Equidae (the horses). Herbivory is a verb and describes what herbivores do, which is eat plant material or plant-like organisms. Herbivores have specific adaptations that allow them to digest plants, like molars made for grinding and specialized microbes in their gut that allow them to break down the plants. Herbivores are often prey for predatory animals, like wolves, tigers, and bears, so they have adaptations that allow them to be aware of their surroundings, like eyes on the side of their head. Herbivory can be found in many animal families including bovids (like cows and buffalo) and rodents (like rabbits and chinchillas). We have many ways by which to defend ourselves against enemies. Plants also have quite a few ways in which they fight off herbivores and pathogens, some of which this lesson discusses. They are constantly infected with all sorts of microorganisms, like viruses. Plants also need to defend themselves against pathogens like viruses, bacteria, and fungi. People have skin that acts as a barrier against these same general types of organisms. Plants also have a superficial layer that acts much like our skin for the same purpose. However, pathogens still make it inside us and inside plants through various ways, thus a secondary line of defense must exist against a pathogen. In people, it's the immune system that attacks and kills off invading pathogens as a secondary line of defense. In plants, the hypersensitive response and systemic acquired resistance are its secondary line of defense. It's like fighting fire with fire. If you burn off an area of forest, the wildfire can't use the wood there anymore to spread anywhere else because everything is destroyed already! The hypersensitive response is limited to only one specific area of the plant. And so, the plant needs a systemic, or body-wide, response to deal with the potential for infection throughout the plant. Before the cells that seal off an area in the hypersensitive response die, they release important chemicals that travel throughout the plant. Once these chemicals reach other cells in the plant, they activate signaling pathways that force these distant cells to produce molecules that protect the plant against all sorts of pathogens for several days. This process is known as systemic acquired resistance. Think of it as a signal to beef up security for a few days in a city if there's a threat of terrorism. Everything will be placed on high alert for a few days. The signal to beef up security is called methylsalicylic acid. It is carried from the site of infection to other parts of the plant where it is converted to salicylic acid, which then activates a signal transduction pathway that confers an acquired resistance to pathogenic attack.